While most people get their news about Iraq from tidbits of fragmented reports funneled through the media, the documentary Operation Filmmaker oddly enough seeks to make sense of the big picture by focusing in on the microcosm of a solitary human portrait that may not have much to do with the actual military conflict at all. 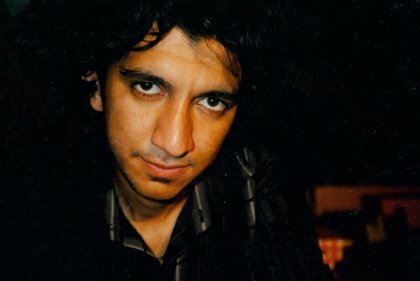 More specifically, the peculiar journey of an Iraqi film student turned refugee through Hollywood hell and back, as he puts the lessons of his own exploitation to use as a survival tool down the rabbit hole of Western society. It’s 2004 when the film within multiple films begins, and student Muthana Mohmed is taking an MTV crew down the war ravaged streets of Baghdad in search of his film school, which has been reduced to rubble. When actor turned filmmaker Liev Schreiber catches the segment on TV, he gets a notion to find and recruit this earnest young man to intern on the Czech movie set where Schreiber is currently directing Everything is Illuminated. Mohmed eagerly jumps at the chance to leave his war torn country to work on a Hollywood production, only to find that the offer may be little more than a publicity stunt. When he arrives, Mohmed learns not only that he’s to function as little more than a servant on the set, fetching tea and snacks for the crew, but that another filmmaker – Nina Davenport, the director of what will evolve into this documentary in question – will be filming him constantly for her own project. And will little regard for his privacy or troubling emotions. As Mohmed grows ever more bored and angry with his paternalistic bosses who themselves become increasingly irritated with his demands for money and meaningful work, the seams holding this questionable project together begin to seriously unravel. And when the by now depressed and bitter youth sees the constantly escalating Iraqi suicide bombings, violence and death on television or through reports from back home, he announces his determination to never return, but rather to seek political asylum in the West (on the basis that the film crew is headed by Jews, which may incur death threats against him) and follow his dreams to work in movies. Whether Mohmed is suffering a deteriorating case of post-traumatic stress disorder or is simply hustling his providers, emerges as a complicated enigma that Davenport leaves open-ended, whether by choice or circumstance. But the demoralizing situation which comes to light, is that Mohmed as a Iraqi may be no more than a hidden agenda, timely promotional opportunity for these Hollywood hotshots and other players in the movie world. Or, just a convenient symbolic guilt cleanser for those disturbed by the US invasion. Which renders Operation Filmmaker, though fragmented and repetitive at times, a complex meditation on the psychological manifestations of cultural conflict, power, victimization and war.